Mt.Namjabarwa,reaching 7783 meters above the sea level,is shaped as a pyramid. 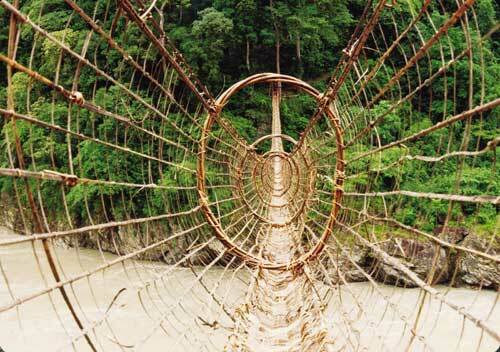 The Yarlong Tsangpo River embraces it to form a peculiar shape resembling as a big house roof. A panorama of Maindu Glacier. The big mountain surrounding by Yarlong Tsangpo Grand Canyon. 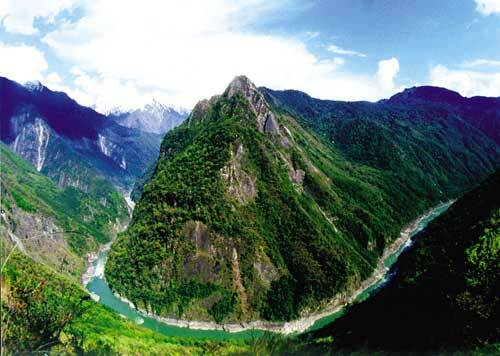 "This beautiful place", Nyingchi, refers to the beauty of mountain ranges, water, valleys, lakes, and even glaciers. No matter how it is defined or named in accordance with tradition, it will never be excessive to credit this place with the description of beautiful; such beauty is barely defined by words. I have traveled to many places in the world, and enjoyed various kinds of spectacular landscapes, but the most fascinating and attractive place, which makes me dream endlessly, is the southeast area of Nyingchi Prefecture in Tibet Autonomous Region(TAR). Nyingchi Prefecture is consisting of Nyingchi, Gongbo Gyamda, Mainling, Nang, Bome, Zayul, and Medog Counties, with a total of 114 thousand sq. metres and a population of 150 thousands. Historically, it is also given the name of "Gongbo Tibetan Inhabited Area" and is home to several ethnic minorities such as ethnic Tibetan, Moinba, Lhoba, Deng people, Bai, ethnic Naxi, Han, and Hui. As a mountainous area where the mountains are cut through by abundant rivers and valleys, Nyingchi is rich with glaciers and lakes. Thanks to the fascinating landscape and favorable weather conditions, Nyingchi is not only referred to as the "south of the lower reaches" of TAR by the Chinese scientists, but also described as the Switzerland of the east. It is an important part of the "Big Shangri-La Ecological Tourism Region" in the region encompassed by Sichuan, Yunnan, and TAR. 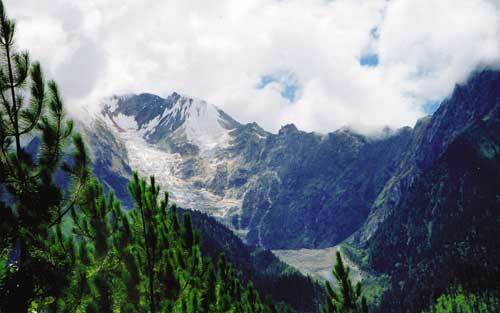 Martime glaciers,surrounded by forest in the south-east of TAR. Nyingchi is referred to as "the Throne of the Sun". Under Nyingchi prefecture's jurisdiction, there are Medog, Gongbo Gyamda (the base and valley), Mainling (the region of herb medicine), Bome (the place to remember ancestors), and Zayul(the most suitable place to live). Nyingchi is a particularly beautiful place decorated with mountain ranges and lying in the west region of TAR in China. Also, it is a rare and unusual land where a large number of world famous mountains are encompassed within this tiny region of only 110 thousands sq. metres. Nang County, Mainling County and Medog County in Nyingchi are situated at the east side of the Himalayas, while Gongbo Gyamda County and Nyingchi County cross over Mt. Nyanchen Thanglha and Mt. Gangdise, but Bome County, Zayul County, and Medog County lie amongst Mt. Gangdise, the east of Mt. Nyanchen Thanglha, and Mts. Hengduan, resembling a convention of mountain dragons. All those mountains benefit from humid and warm air from the Indian Ocean that flows down from the grand canyon of Yarlung Tsangpo River. Dressed with abundant forests, the mountains are permanently capped with snow shining silvery white in the sunlight. The organic world of primitive forests perfectively integrates with the world of ice and snow to form a harmonious environment. This fascinating landscape lies in the southeast of the Qinghai-Tibet Plateau of China, and forms a natural and ideal picture filled with mountains and waters. Mt. Namjabarwa (7782 metres above the sea level) is a typical charming mountain range exemplifying the beauty of Nyingchi. It is not only the highest mountain in Nyingchi Prefecture, but also listed as the 15th summit of the world (the peaks of the other 14 are above 8000 metres). The fundamental reason for the fame of Mt.Namjabarwa is because it works together with the Gyala Beile Summit, situated opposite the river at 7284 metres above sea level, to create the biggest canyon of the world-the Yarlung Tsangpo Grand Canyon. Pilgrims frequent this mountain with its knife-edge cliff that allows water and ice to flow down to flourish ancient forests. Each year showers come from the Bangladesh Gulf of the Indian Ocean, accompanied by rolling clouds, swaying forests and surging river waters. After that, the summit of Namjabarwa Mountain becomes the most beautiful in China as well as one of the world's highest mountain peaks. The beauty of Nyingchi is particularly evident in its valleys. Since the successful crossing on foot of the Yarlong Tsangpo Grand Canyon in 1998, by Chinese scientists, the mystery of the canyon has finally been unrevealed. Its total length is 496.3 kilometres and depth 5382 metres-which makes the canyon worthy of the title as the world's biggest canyon. The edge of Gyema Yangzom glacier is the source of the Yarlung Tsangpo River that flows westward from the east without stop. Then it zigzags through the Himalayas and Gangdise Mountains, respectively converging with Dokshung Tsangpo River, Nyangchu River, Lhasa River, and Nyangqu River. As the river banks of the Long River and the Yellow River were historically the cradle of the Chinese nation's civilization, so the Tibetan people living along with the Tsangpo River bank have fostered their diversified culture. With the world-famous Yarlung Tsangpo Grand Canyon and well-known mountains, Nyingchi also has the third biggest world canyon-Parlung Tsangpo Canyon, which is just listed behind the number two (Kali Gandaki Canyon in Nepal), crosses over Annapurna Summit (8091 meters above the sea level) and Dhaulagiri Summit (8172 metres). Parlung Tsangpo Canyon is the main tributary of Yarlung Tsangpo River with 50 kilometres length (calculated from the entrance of Yiong Lake) or 76 meter kilometres (calculated from the lake entrance where the landslides in Gu Township blocks it); it is 4001 metres in depth. Wild yew Yarlong Tsangpo Grand Canyon. In terms of enjoyment, Parlung Tsangpo Canyon might be a much more interesting topic than many other famed canyons, in particular when compared with its sister canyon, the Yarlung Tsangpo Grand Canyon. After entering Bome County, the famed national highway between Sichuan and Tibet changes direction and extends further along the riverbank. No matter whether walking or riding a horse or even driving by car, you will surely enjoy the magnificent scenery of the world's Number Three Grand Canyon. In particular, the ancient ecological landscape with the biggest virgin forests in China and the highest concentration of monsoon-type maritime glaciers will catch your eye. Nyingchi shows its beauty not only through the Grand Canyon with its geographical "penetrability", but also its rich rivers. Many people, even some experts, mix up the concepts of mountain valley, river valley, and canyon. [The author in his paper on ? ?National Geography' first described the difference between canyon, mountain valley, and river valley, after his experience of a scenery survey of the No.318 national road in 2006. The author believed that the biggest difference was that the canyon is featured with "penetrability" in its physiognomy. Please see ? ?National Geograpy', 2006(10)]. 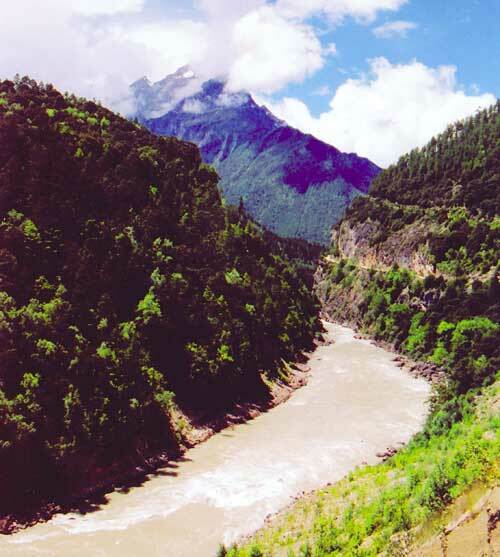 The rivers of Nyingchi are Zayul River, Potoh Tsangpo (Parlung Tsangpo River's tributary), Yashu Tsangpo, Yiong Tsangpo, Tongjug Tsangpo, and Nyangqu River crossing over the Gongbo Gyamda County and Nyingchin County. All of these rivers are interwoven with the glaciers, forests, and local inhabitants to form a complex and splendid landscape. Along with abundant water, rich resources, and Bangladesh tigers as well as tremendously diversified flora are living in the many river valleys. Nyingchi shows its beauty through glaciers. Glaciers in the grand canyon. China is famed for low latitude glaciers, with a total of 46,252 glaciers covering 59,402.60 sq. meters. Amongst them, 8,607 monsoon-type maritime glaciers are covering 13,203.2 sq. meters. Those glaciers usually lie in the southeast region of Nyingchi, the west part of Sichuan, and the northwest part of Yunnan. The southwest monsoons of the Bangladesh gulf and the southeast monsoons of China mix up to form those glaciers. The temperature of the ice in glaciers mostly reaches zero centigrade. The melting areas of these glaciers directly correspond with the edges of ancient forests. The Yarlung Tsangpo water system in Nyingchi Prefecture accounts for respectively 68 percent and 56 percent of the total area and the total number of monsoon-type maritime glaciers in China. The area covers 9000 sq. meters with 4800 glaciers in total. 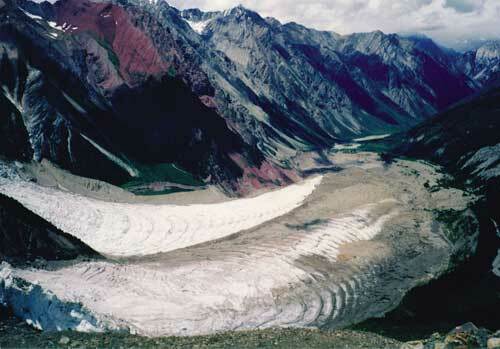 Khaqing glacier in Yi'ong Tsangpo Valley is 35 kilometres long and ends up with 2600 meters above sea level. The Atra Glacier in Zayul County ends up at 2550 meters of elevation. These two glaciers are giant mountain valley glaciers with the lowest altitude and extending toward the end of the Qinghai-Tibet Plateau. The Rolgu glacier is adjacent to Khaqing Glacier and is world-renowned glacier after the finding of the wreckage of a World War II aircraft. Tea production in Yi'ong is just over ten kilometres away from the end of Khaqing Glacier, while Atra Village, close to Atra Glacier, can even plant some sub-tropical plants, such as wheat, cucumber, pumpkin, and beans. Nyingchi encompasses many giant glaciers exceeding over 10 meters each in length and their melting regions usually extend to the edges of ancient forests. The accumulated regions of glaciers encounter with their regions of melting form giant, spectacular glacier waterfalls that seem to reach to the sky if seen from below. The difference of height between the Atra glacier and Khaqing glacier is 600-700 meters. However, the most spectacular view is the ancient sediments of glaciers and moraine lakes in various shapes left after the melting of glaciers. Thus, this region has become a famed ecological tourist attraction. The Tsogo Lake in Gongpo Gyamda is named the national 4A natural scenic spot by scientists. 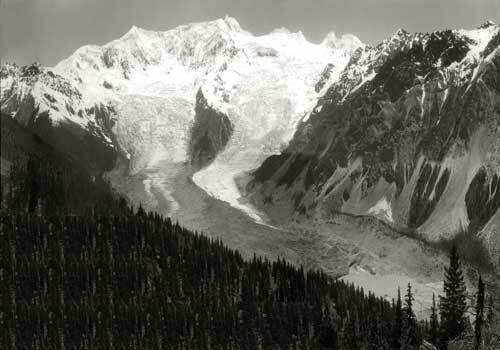 The thousands of undulating moraine hills in the Valley of Potoh Tsangpo River in Bome County, beside the riverbank, were washed down by ice and water. But for studies by scientists on glaciers, many people would have thought that those hills were the remarkable pieces made by aliens or maybe a cemetery left from ancient battles. Nobody would like to believe that crossing over villages, farmland and roads, were actually the places where the icy rivers overflowed and the climate was frozen tens of thousands of years before. 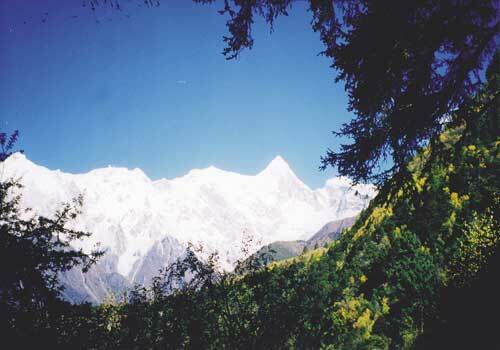 Nyingchi's beauty is also manifested in its sub-glacial rain forests. In China there are three ancient natural forests: the northwest forest region, the forest region at Henduan Mountain, and region at the southeast of Tibet. Nyingchi is the principal area of the ancient region in the southeast of TAR. The abundant rainfall and the melting ice water is as mothers milk to nourish the lush and extensive virgin forests, which in turn have generously and disinterestedly fostered the lives of ethnic people living here for generations (such as the people of Gongbo, Moinba, Lhoba, and Deng people). White clouds crossing the blue sky and vast forests directly connect with spectacular glaciers-all harmoniously integrating to form a splendid picture. 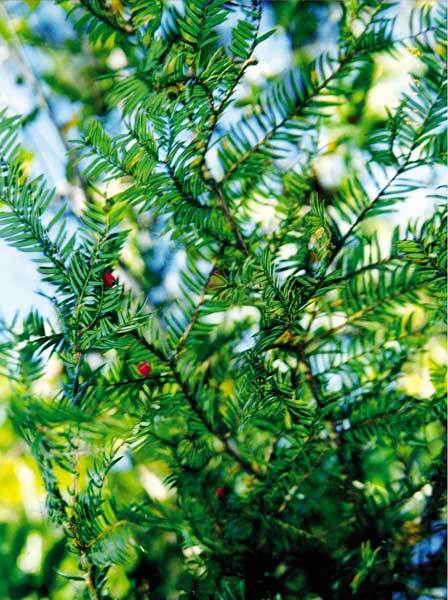 Abundant, diverse plants thrive in the immense primitive forests. The huge spruces and various kinds of pine and China firs competitively occupy the space in the kingdom of forests, while small shrubs, like azaleas, add a touch of colour to the forest floor. Following the zigzag lianas to the depth of the forests, you can easily find big fungi comfortably thriving on the soft bed of decayed leaves, along with lichen, enormous grasses and flowers sprouting from the rich earth. They give every appearance of believing that they are enjoying true happiness as freely living beings in this world. Liane bridge in Medog County. In short, the ancient forests in the southeast of TAR exist in perfect balance with the air, the earth, and water resources at this region. Speaking on behalf of my colleagues who have been embarking on scientific research for several decades, we have found the ancient forests close to the monsoon-type maritime glaciers have a better environment than those far away, in terms of diversify of plants and density of growth. Making a comparison of the forest type map and the forest stock map between the forests adjacent to glaciers and far away, the former ones have much more diversity. Obviously, the distribution and growth of forests is closely associated with glaciers. In fact, in the half year of summer, glaciers are a comparatively "cold source" of atmosphere, and "theyabsorb" the passing airflow to benefit an increase in rainfall. Nevertheless, during the half year of winter, the cold surface of the glaciers was blown by cold air, which makes the glaciers become "heating resources". The decrease of temperature of glaciers releases energy, which, to some extent, restricts the decline of the local temperature. Such circulation of water and heat, facilitated by glaciers, surely benefits the local plants and forests. Moreover, the melting glaciers supplement atmospheric moisture that augments the vegetation of the forests. Thereupon, it is reasonable that we name the forests adjacent to the monsoon-type maritime glaciers as the "glacier rain forests". Being the place with the highest density and biggest number of monsoon-type maritime glaciers, Nyingchi, of course, has the most extensive "glacier rain forests", covering about 2000 sq. kilometres. Whether or not the forest resources, biodiversity resources or ecological tourism resources there are in Nyingchi, the glacier rain forests in Nyingchi Prefecture are most valued as immeasurable and irreplaceable forests. Nyingchi is an extremely spectacular landscape, showing its beauty in truth, originality, and nature.